As discussed previously on this blog, natural gas and electricity prices in the wholesale markets have declined precipitously (click here for more information). What is more obvious, certainly at the gasoline pump, is that crude oil prices, unlike natural gas prices, have been on an upward trend. The above graphs show (i) the monthly average spot price history of natural gas at the Henry Hub in Southern Louisiana and (ii) crude oil prices, or more specifically, prices of West Texas Intermediate (WTI) at Cushing, Oklahoma. Prices are shown dating back to January 1986 and through October 2011. Natural gas prices and crude oil prices both hit a peak during the summer of 2008 and then dropped dramatically as the economy went into recession. Natural gas prices have remained low. Crude oil prices recovered. Natural gas prices and crude oil prices have become decoupled. Historically, on an energy equivalent basis, crude oil used to trade at about a 50% premium to natural gas, reflecting crude oil’s greater energy density, portability, and flexibility. More recently, that premium has increased to more than 300% or more (see graph above). Thought of another way, natural gas is trading at a more than a 75% discount to crude oil. As of this writing, natural gas is trading at $3.32 per thousand cubic feet (MCF) and crude oil at $99.41 per barrel; crude oil is trading at a 400% premium to natural gas on an energy equivalent basis. Why the divergence? Crude oil prices are driven by influences in the world energy market, the largest being growing demand in developing countries. US natural gas prices are driven by factors specific to the integrated North American natural gas markets. There is a common perception that energy prices have been, and continue to be, on a one way path upwards. Is this the case? No. 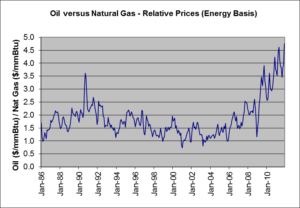 The graph above provides a historical view of natural gas prices. 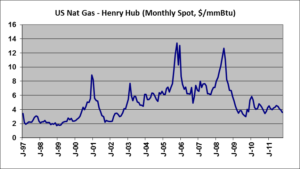 Plotted are the monthly average spot prices of natural gas at Henry Hub (a trading hub in Southern Louisiana) going back to 1997. 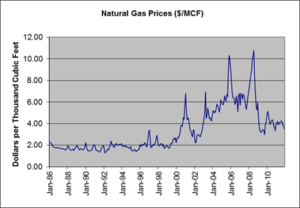 During November 1997, natural gas prices averaged $3.08/mmBtu. 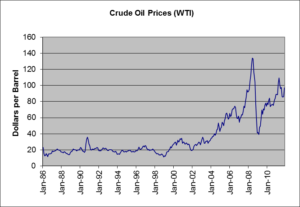 One hundred and sixty-eight months later, during November 2011, prices averaged $3.28/mmBtu. While natural gas prices are volatile, they do not “always go up.” In fact, they have declined. The prices presented above are in nominal dollars. If they are adjusted for inflation, today’s prices are significantly lower in terms of real dollars. 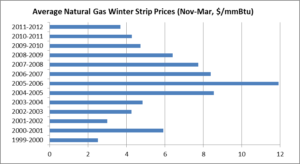 The natural gas “winter strip” represents the average futures price for natural gas over the five month period of November through March. As seen on the above graph, for this 2011/2012 winter, the winter strip closed below $4/mmBtu, which is a 10 year low. The two big drivers of declining natural gas prices are increased supply, in the form of new shale gas reserves, and decreased demand, resulting from the weak economy. What does this mean for electricity? In the Mid-Atlantic, natural gas prices and electricity prices are highly correlated. Commercial businesses in many locations are now seeing electricity supply (generation and transmission) prices below 8 cents per kilowatt-hour. Wholesale electricity prices are volatile. Because electricity cannot be stored in any meaningful quantity, electricity load (demand) and supply must be matched in real-time. 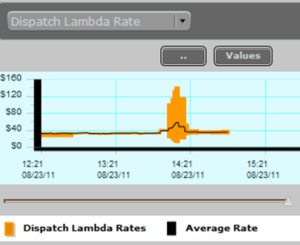 Matching load and demand is the challenging job of grid operators. To give you an idea of how volatile prices can be, take a look at the graph below (source: pjm.com). Unlike a few weeks ago, weather this week in the Mid-Atlantic has been mild. Mild weather generally leads to low and stable electricity prices. Prior to 2 PM yesterday, 8/23, wholesale prices in PJM were below $40 per megawatt-hour. Then came the earthquake. Very quickly, as a precautionary measure, a number of nuclear power plants were immediately taken offline. In some areas, spot prices in the wholesale market jumped to $140 per megawatt-hour. That is a 250% increase. Within approximately 20 minutes, however, spot prices were back to $40 per megawatt-hour as the grid operator was able to bring online other resources or implement demand response measures. As volatile as these prices seem, during the summer heat wave, spot prices in the PJM wholesale market at times exceeded $600 per megawatt-hour. For short periods of time, spot prices in the ERCOT (Texas) market have reached $3,000 per megawatt-hour. Is the Shale Gas Revolution for Real? Some have described the proliferation of shale gas plays as a “quiet revolution.” But, the revolution is not so quiet. Stories now appear regularly on the front page of the Philadelphia Inquirer, the New York Times, and many other newspapers far from the oil patch. What are the facts? US natural gas production is higher than it has been over the last 30 years. On a twelve month rolling basis, US natural gas withdraws as of July, 2006, were 23.1 trillion cubic feet (TCF) (see note below). Current annual US natural gas withdraws are 26.5 TCF, a 15% increase in less than five years. Examination of the data from the last five years on a month-over-month basis highlights the steady upward progression of natural gas production in the US. 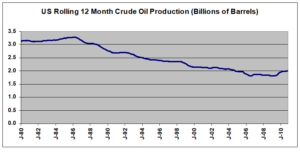 By contrast, annual US crude oil production has declined significantly since peaking at 3.6 billion barrels in 1971. Currently, US crude oil is being produced at a rate of about 2 billion barrels per year. This is a 44% decline from the 1971 peak. The stark divergence in the trends of natural gas and crude oil production in the US stands out even more when the production levels of the two forms of energy are converted to a common energy unit. 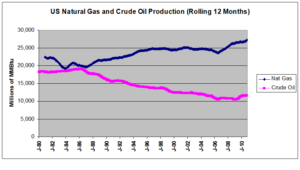 The graph below presents US natural gas and crude oil production in millions of mmBtus. A mmBtu is a million Btus. Conversion factors of 1,025 Btus per cubic feet of natural gas and 5.8 mmBtu per barrel for crude oil were used. The discussion above has focused on natural gas production. Natural gas reserves have increased even more dramatically. The DOE Energy Information Administration recently estimated US recoverable unproved shale gas reserves at 827 TCF, 474 TCF more than their estimate last year. So, what could derail the natural gas revolution, “quiet” or otherwise? The short answer is public sentiment related to two environmental concerns; (i) potential groundwater contamination, and (ii) the disposal of drilling and fracking fluids. The failure of a well’s casing can lead to drilling or fracking fluids seeping into fresh water aquifers. Generally, fresh water aquifers are encountered in the first few hundred feet of a well while shale gas reserves exist thousands of feet below. This is not an environmental risk to be ignored. However, over many decades there exists a successful track record of keeping ground water aquifers isolated from formation fluids (natural gas, crude oil, natural gas liquids and formation water). The same techniques and technologies can be applied to keeping groundwater aquifers isolated from fracking fluids. The improper disposal of drilling and fracking fluids poses a serious threat to surface ecosystems as such fluids can contain toxic materials. Effective regulation and enforcement of the handling and disposal of these fluids is imperative. Recently, the development of fracking fluids using chemicals “sourced entirely from the food industry” has been announced. In any case, the disclosure of detailed information about the chemicals used in its fracking fluids is critical. Note: Natural gas and crude oil production and reserve data was obtained from the US Department of Energy, Energy Information Administration website. When purchasing energy, there is a price/risk continuum between fixed price contracts and variable price contracts. Fixed price contracts allow you to minimize your exposure to price risk by transferring this risk to a supplier. With a variable price contract, you are accepting the risk associated with changes in the market price of electricity. This is not an insignificant risk as electricity prices are highly volatile. And, electricity price risk is asymmetric, meaning there is much greater potential for upward movement than there is for downward movement (prices are bound by zero on the downside but are not bound on the upside). With variable price contracts, suppliers transfer electricity price risk to you. In exchange, pricing to you should be at a discount. Most variable price contracts will base changes in the contract price to changes in an index. Here in the Mid-Atlantic, the grid operator, PJM, tracks hourly prices by zone. These hourly prices are referred to as “LMP” which stands for “locational marginal price.” These LMP prices are a transparent index, meaning PJM makes them available. Most suppliers who sell variable price contracts will price them as “LMP plus a fixed adder” and they will tell you their “adder”. LMP is passed through to you dollar-for-dollar and the “adder” is their margin on top of LMP. With the same LMP as a basis, you can then compare what “adders” different suppliers are offering. This approach is transparent. Some suppliers who sell variable price contracts base their prices on indices that are proprietary and vague. There is no place you can go to see the index. Further, they often don’t disclose what their margin is on top of the index and they don’t commit to keeping the margin fixed. This allows them great flexibility in what they charge you each month. You are left vulnerable and there are no checks and balances. If your are currently purchasing from a suppler under a variable price contract that does not have a transparent index and does not have a fixed “adder” we recommend that you review your contract and examine all of the suppliers monthly invoices to see if you have been getting the benefit of an “index” product. Electricity markets were deregulated in Pennsylvania over ten years ago. At that time, the Pennsylvania Public Utility Commission implemented two measures. They allowed electric utilities to recover their “stranded costs” or the cost of investments they had made that they, the utilities, argued would no longer be of value in a deregulated environment. These costs were recovered through a billing surcharge termed the Competitive Transition Charge, or CTC. The Pa PUC also required the electric utilities to freeze or “cap” their rates. So, what will happen at the end of this year, 2010? The good news is that the CTC surcharge will expire and no longer be charged to customers. The bad news is that the rate caps will also expire. Currently, the CTC surcharge represents about 30% of the total bill for small commercial customers and about 26% for large commercial customers. The elimination of the CTC charges will, by itself, lower customer’s bills significantly. At the same time, PECO’s generation and transmission charges currently represent about 50% of the total bill for small commercial customers and about 58% for large commercial customers. These charges are set to increase dramatically. Over the more than ten years that PECO’s rate caps were in place, the wholesale cost of electricity increased. As a result, PECO’s current combined generation and transmission rates are significantly “below market.” PECO generation and transmission rates beginning in January, 2011, will reflect the results of their procurement efforts in the recent and current wholesale energy markets. During the spring and summer of 2010, large commercial customers had the opportunity to sign up for and participate in a default service auction PECO administered. For those large commercial customers who chose not to participate, their options as of 1/1/2011 will be to receive default service from PECO at the highly volatile Day Ahead Hourly Rate or to purchase energy from an independent electric generation supplier (EGS). PECO is in the process of acquiring electricity in the wholesale markets for its medium and small commercial customer default service. While most of this supply was contracted for during the fall of 2009 and the spring of 2010, one more auction will take place this coming September. If we were to take a snap shot today, there are two primary reasons why PECO’s combined generation and transmission default rates will, for most customers, be higher than the cost customers could acquire electricity for from an independent electric generation supplier. First, when PECO conducts an auction, suppliers must bid on an uncertain volume and an uncertain average load profile. At the time of the auctions, it is unknown how many of PECO’s customers will remain on default service after January, 2011, and what their combined load profiles will look like. In order to protect themselves, suppliers must add a risk premium to their bids as a way to protect themselves from this uncertainty. Secondly, the wholesale markets have been generally falling since the summer of 2008. PECO’s first and second auctions for its medium and small commercial customers were conducted while wholesale markets prices were higher than where they currently stand. The following graphs show Avalon Energy Services’ current estimates of where PECO’s default rates may land along with current estimates of what customers could obtain electricity for from independent electric generation suppliers. Please keep in mind that the actual price of electricity purchased from independent electric generation suppliers can vary significantly based on a business’ individual load profile and credit standing as well as many influences in the wholesale markets. Having pointed this out, leaving PECO for an independent electric generation supplier may not necessarily be the best choice for all customers. It really depends on your unique situation. Avalon Energy Services stands ready to help you. Let our experts assess your specific situation and develop an energy procurement strategy that best suits your needs. A number of people in Pepco’s service territory have asked about Constellation Electric’s (Constellation) fixed price electricity offer. In the commercial world, most customers view the likelihood that energy prices will go up as much greater than the likelihood that energy prices will fall further. I think this makes sense. Energy prices are currently low, unfortunately, because of the weak economy. As the economy recovers, demand for electricity and natural gas will likely rise. Commercial customers are currently locking in electricity and natural gas prices for two, three and even five years. Constellation is offering to supply electricity to residential customers for one year at 9.65 cents per kilowatt-hour (kWh) and for two years at 9.55 cents per kWh. On their promotional offer, they note that their prices are 13% (for one year) and 14% (for two years) lower than Pepco’s current rate. Is this a good deal? Here are a few things to consider. For most residential customers (Schedule “R”), Pepco’s current generation rate is 11.842 cents per kWh and its transmission rate is 0.348 cents per kWh, bringing the total G&T rate (excluding taxes) to 12.19 cents per kWh. These generation and transmission rates are in effect from 6/1/10 to 9/30/10. On its website, Pepco has posted its generation rate for the upcoming period of 10/1/10 to 5/31/11. This rate is 9.885 cents. Assuming the transmission rate during this eight month period remains the same as the current transmission rate, the total G&T rate (excluding taxes) will be 10.23 cents per kWh. Based on this alone, Constellation’s offer of 9.65 cents per kWh seems attractive. However, Constellation’s rate is only 5.7% lower than the forward Pepco rate that runs through 5/31/11. Beyond 5/31/11, any discount or premium to Pepco’s rate cannot be determined as Pepco’s rates have not been defined and won’t be defined until sometime in the future. Read the “Renewal” paragraph in Constellation’s Terms and Conditions section. It says, “This Contract shall be automatically renewed with the revised terms and conditions (including any updated pricing) unless you cancel the renewal by notifying Constellation Electric in writing within 15 days after receiving notice of the new prices and/or terms and conditions.” This is a very short window. In the “Term” paragraph, it says that the contract will automatically renew for an additional 12-month renewal term unless terminated. So, if you miss the window, or you don’t terminate the contract and pay a $150 penalty, you will be with Constellation for another 12 months at a rate they will define in the future. If you are interested in locking in a fixed rate, there are other suppliers making offers. In addition to comparing their prices, be sure you read and understand their terms and conditions. You can find alternative suppliers on the Public Service Commission’s website.